www.vicki-2bagsfull.blogspot.com. 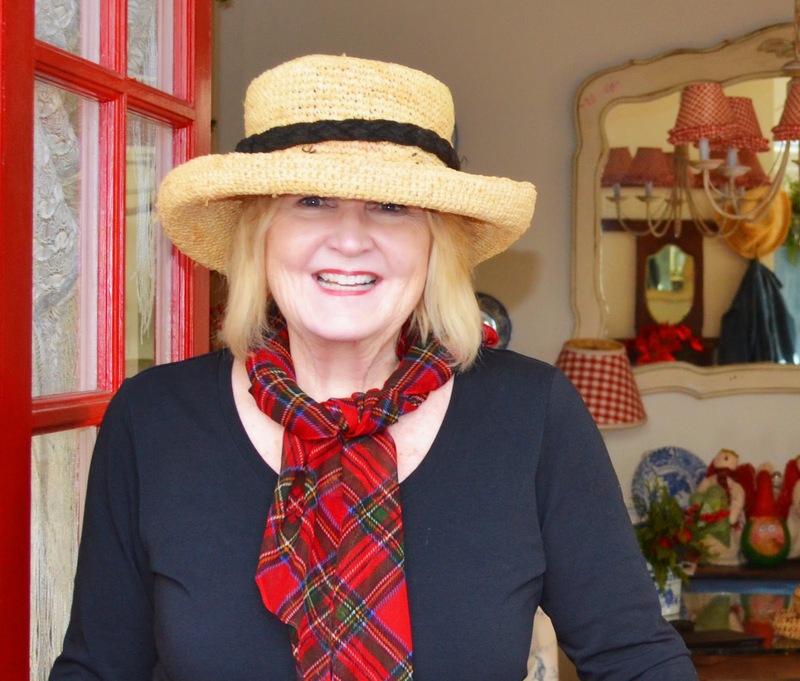 For those of you who don't know me my name is Erin Houghton - I am retired and a lover of gardening, painting, photography, re-purposing and finding vintage and flea market finds for my home and garden - some of which end up in one of my paintings. Part of the fun of creating is sharing and I started my blog to share the joy of creating all things that make my heart sing. Along the way blogging has become a fun way for me to make new friends all over the world who share similar interests as well as open my eyes to new and interesting ideas for my home and garden. It changed my life in ways I never dreamed of and as a result several magazines have published my photographs and used them to write articles about my home, art and garden and I was invited to be a Contributing Editor to a new on line life style magazine Southern Guide to Life www.southernguidetolife.com . Just goes to show that you never know who may discover your blog!! 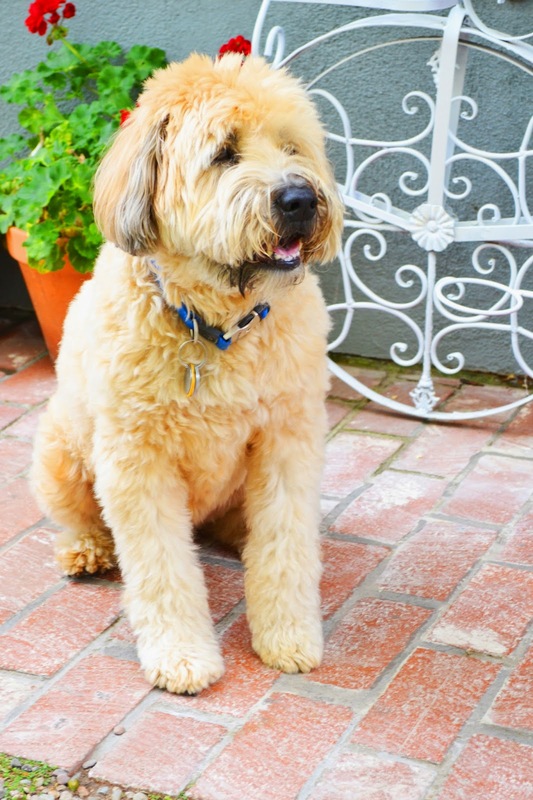 Meet Bentley, My Studio Assistant, he is a rescue Soft Coat Wheaten Terrier and was 2 when he became part of our family and is almost always involved in my blog. My garden gate is always open to welcome you. 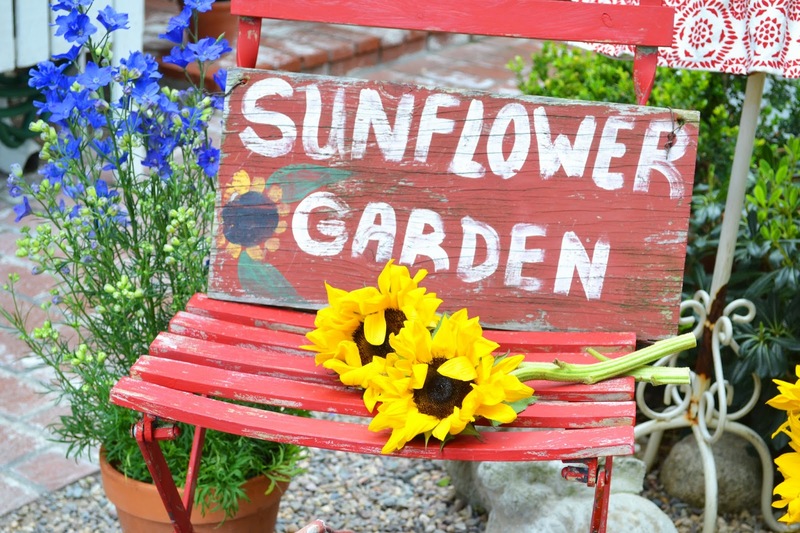 My blog takes my readers on seasonal tours or visits around my small space garden that is divided into rooms and gives tips on container gardening and using flea market finds in the garden. We also leave the garden to explore - here - there -everywhere! Spring with the container flowers in full bloom. Summer on the kitchen patio with newly painted "faux" flagstones and flea market finds. Fall in the garden with my metal dress form "Blossom"
Winter/Christmas - note Blossom traveled to a new spot in the garden for Winter - she moves around a lot and likes to wear different outfits. Sometimes we have "art in the garden" where I share with you the flowers or vintage items that inspired my art. My mother's family was from Ireland and I grew up in a family where sharing a cup of tea with friends was an act of friendship, and it has become part of my blog to offer you a cup of tea. Sometimes we have tea in the garden or the kitchen if it is chilly outside. 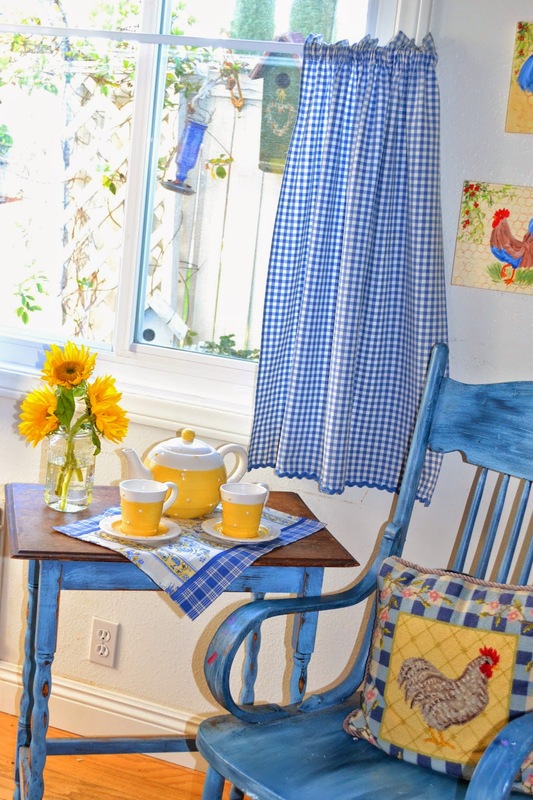 Some times I share my re-purposed flea market finds in my cottage home with my readers. I live in Southern California just over a mile from charming Balboa Island on beautiful Newport Bay across from the Pacific Ocean. 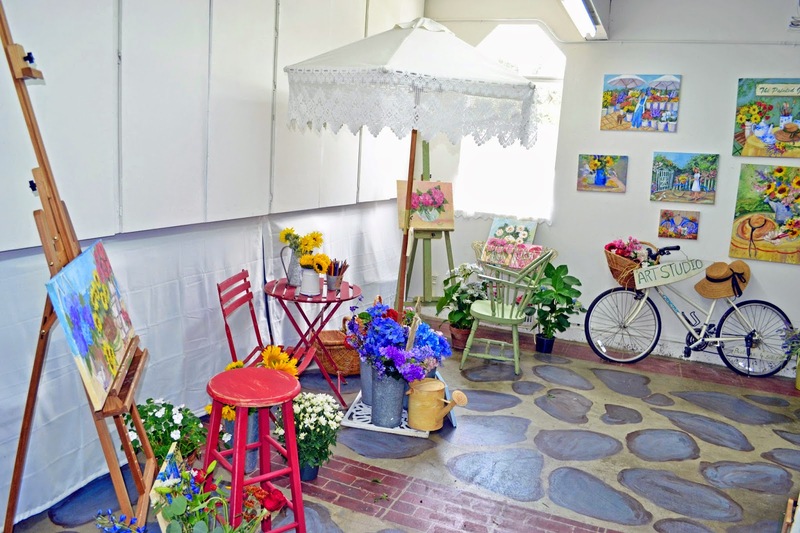 We may take the ferry to Balboa Island to my visit the annual art show (where I sometimes show my art) or look at the charming cottages for inspiration. 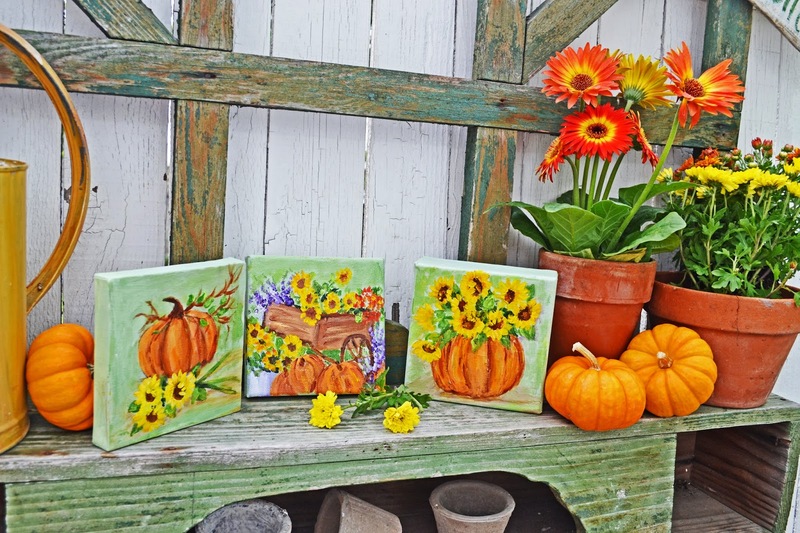 We may go to Rogers Gardens in the fall to look for pumpkins or inspirations to paint and if you want you can join in on my art 101 class and paint something yourself. 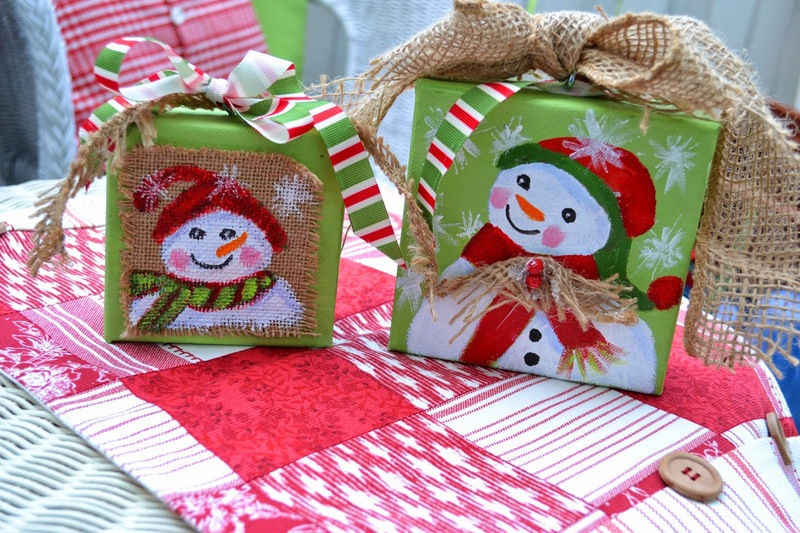 Some of the easy Art 101 paintings we have painted together..
At Christmas time you are invited to my cottage home and garden tour and if you want you can join in and paint a cute snowman painting in one of my Art 101 classes. My art studio in my garage where we have our Art 101 lessons. 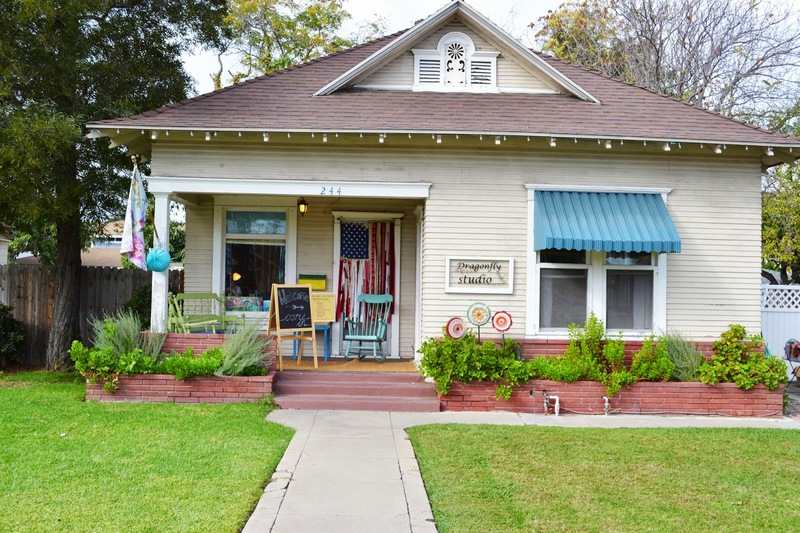 Sometimes we go to Old Town Orange to visit charming shops.This is the studio of my friend artist Libby Williamson who is a designer, teacher and fabric artist. Some of Libby's fabric creations. I am a lucky 13 year breast cancer survivor and use my "pink" art to help raise money to find a cure during October Breast Cancer Awareness month. To celebrate Vicki's fabulous Grow Your Blog Party I am giving away one of my most popular original 8x10 paintings of a pink bicycle in a lavender field. All you need to do to enter is leave me a comment that you would like to be in the drawing - everyone is eligible including international visitors. The winner will be randomly picked and the winner announced on February 15, 2015 on my blog. Thank you for stopping by. For those of you new to my blog I am delighted to meet you. For my regular readers I sincerely appreciate your visits, e-mails, comments and those who follow my blog. Thank you to Vicki Boster for hosting the Grow Your Blog Party. Please stop by her blog to join the meet and greet party at www.vicki-2bagsfull.blogspot.com where you will be able to visit lots of new blogs and meet everyone participating. I always end my blog with a Bible verse or Psalm. And peace to you dear. Lovely post, your garden and home is always so very lovely. And of course your Assistant Bentley. You can tell that he loves his mom. Aren't rescued dogs the very best. I have two and they are the best lovely dogs. The Border Collie, Waldo is never far from me. Please enter me into your give away. What a lovely gift for someone to receive. Enjoy our lovely weather as it looks like we are going to get rain off and on all next week. YEA. I was playing in the garden this morning and can hardly wait to get in and dig in the dirt - just a farmer at heart. Blessings to you dear blogging friend. Erin, it has been a delight to meet you and visit your beautiful garden such colours and variety, no wonder you are inspired to capture it all on canvas. Enjoy the party and if you have the time do please pop over to Normandy for a visit. BTW I'm now your latest follower. Wow, your blog is BURSTING with color today. I enjoyed it so much. I am a "former" S. Cal Gal (from San Diego) who now lives in PA. I am also an almost 13 year survivor of Breast Cancer and thankful for every day! Thank you for visiting my blog today. HI Erin, I'm already a follower since the last Blog party. I would love to live in your home, so cosy, so artistic, so colourful, everything looks so wonderful! Wonderful that you've been cancer free and are enjoying life to the max! Love the give-away painting and I hope I can win it! 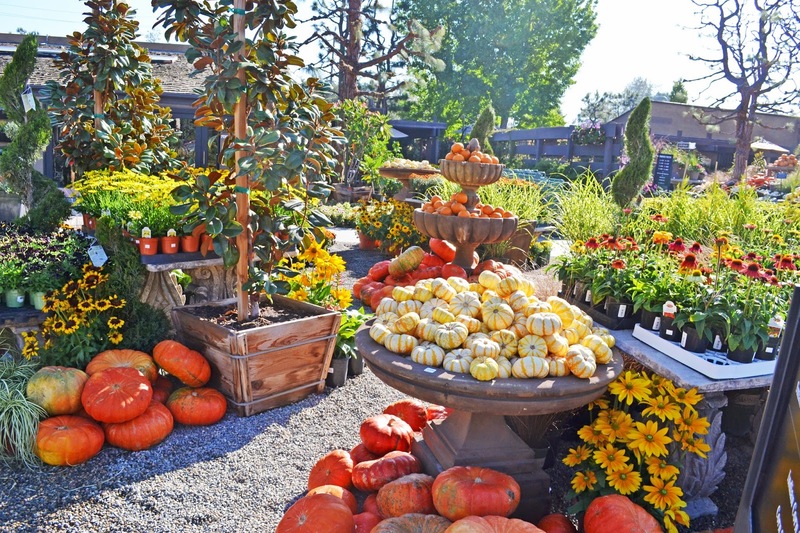 Your home and garden are both AMAZING. So colorful. I just want to move in and sit out there forever! 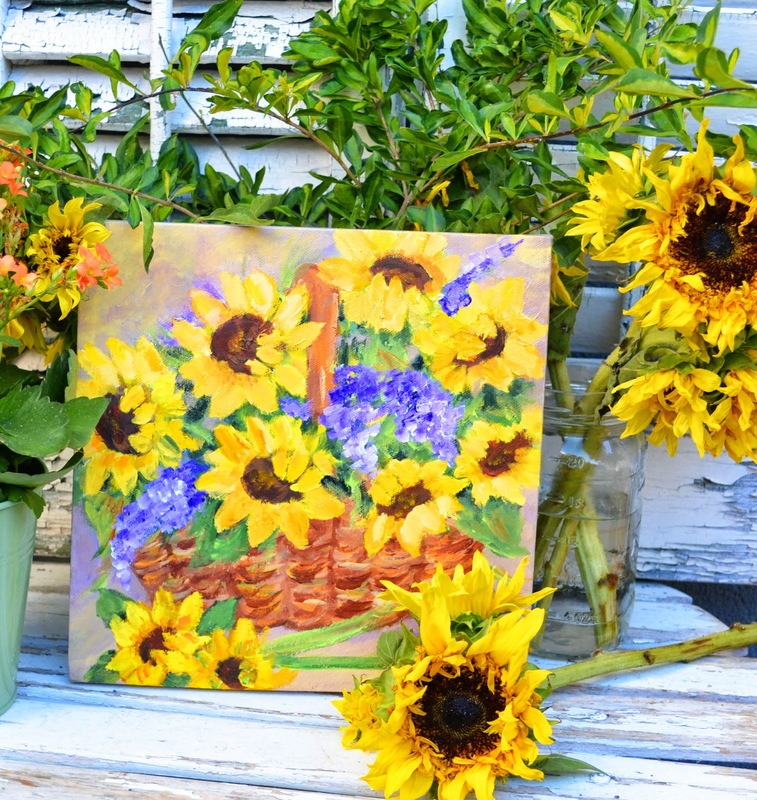 So much wonderful colour, your garden is stunning such great inspriation for your painting, stopping by on blog hop. Hi Erin, I'm one of Vicki's helpers checking all the links for the Grow your Blog hop. Ohh my your garden is AWESOME and I love your paintings. I wish I had that kind of talent. Have a great day. Your gardens are so lovely! Bently is just adorable. Thanks for participating in GYB! 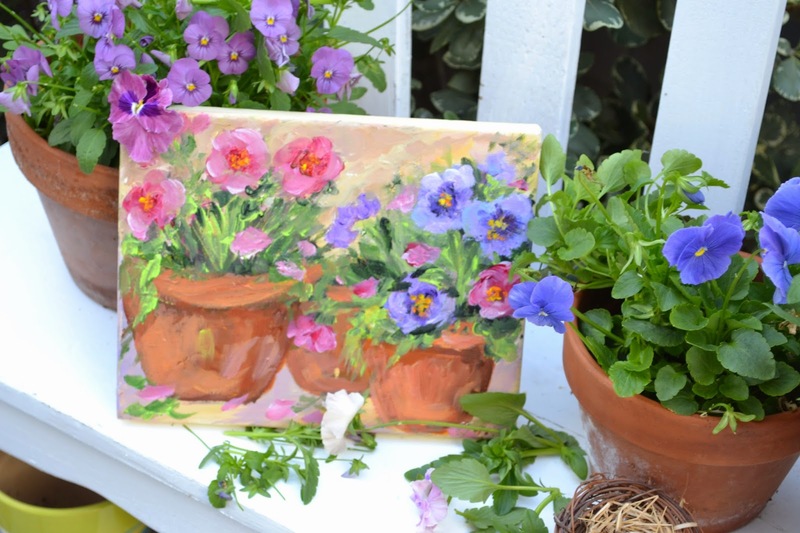 Your garden is beautiful and so is your painting! I see Bentley is still eager to help in the garden ! You already know I love your art, your way of living, your spirits and your photos. 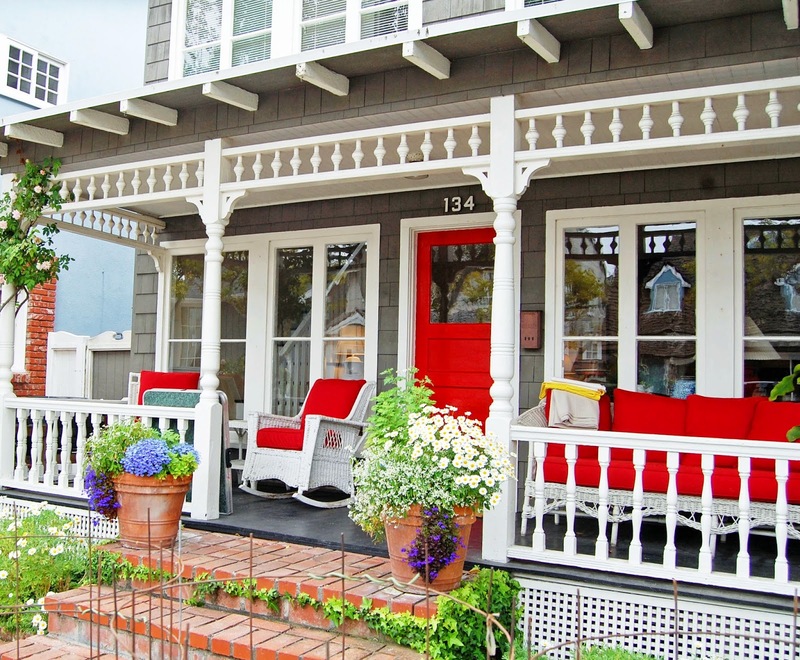 Particularly those of Balboa Island. They make me dream. Who knows, one day I might visit California. Lovely, lovely gardens and joyous art! What fun to get to meet you through the GYB party. Bentley is adorable and you know from your visit to my blog how much I love a canine companion. Happy to meet you Erin. Your gardens are beautiful. Say hi to Bentley for me. I am stopping by from the party-your blog is so gorgeous-love the gardens and the artwork-I will be a new follower your blog is so inviting. Well, of course I would like to be in the drawing but I also want to say how much I enjoy every visit to your Painted Garden, your beautiful work, bright colors and especially sweet Bentley. It's always a treat! LOVE YOUR BLOG... LOVE THE PINK BICYCLE PRINT. CONGRATS ON BEING A SURVIVOR!!!! Your blog is inspiring! Bentley is awesome. I look forward to following your blog. I would like to be in the drawing! Your garden is beautiful! 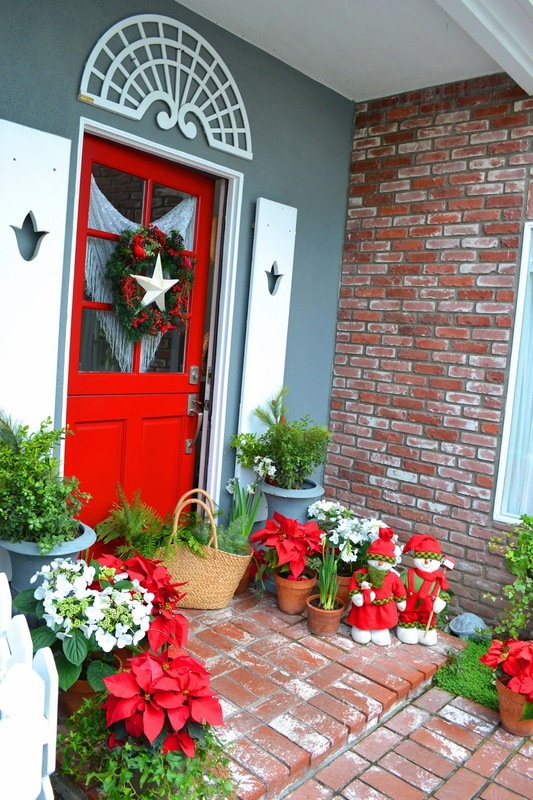 Your home and garden are so inviting and I love your artwork. I have lost friends to breast cancer and have also some who are survivors and I'd love to win your bicycle. 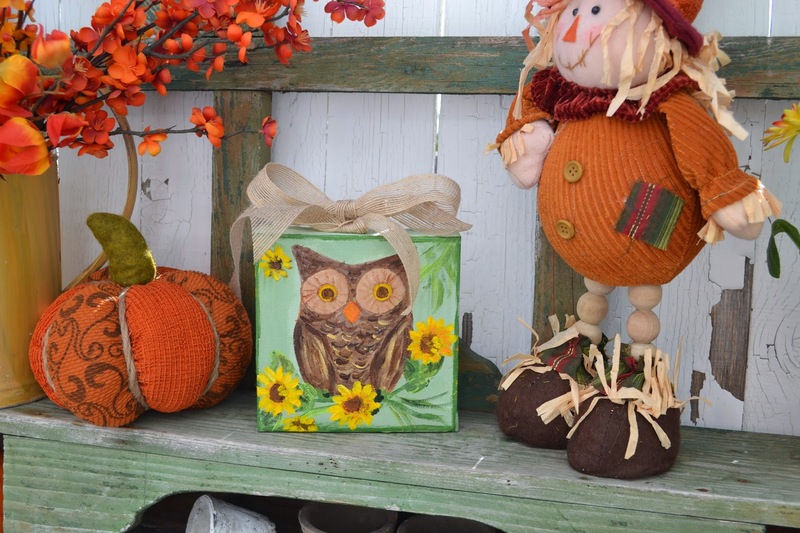 Hi Erin, I'm here visiting from the Grow Your Blog Party and I love your blog and you are a talented artist! I just joined your blog via google friend connect. I look forward to becoming blog friends. I do hope that you will stop by my blog Julie's Lifestyle to visit and enter my giveaway too. I love the painting you made for the giveaway. Bentley is so cute and Blossom, well she is just fun and makes me smile! What a wonderful, colourful blog! I love your paintings! And your garden is a delight. Your blog is such a colorful place - a welcome sight for my cold Wisconsin self! Congratulation on being a 13 year survivor! You have such beautiful things! I love your cottage style and paintings. Stopping by from the GYB hop. Hope you have a wonderful week! What fun it's been to visit you! It's bitterly cold here at the moment and to see all the bright colours in your pictures just made my day (oh yes, and seeing your beautiful furry puppy sure helped too!). Thank you for the invitation to visit! Your blog is beautiful and your photos are fabulous! It’s lovely to meet up with you again at Vicki’s Grow Your Blog party! Your beautiful colourful world is such a joy to visit! I love the mirrored blue window and shutters on the wall – you’ve inspired me to do something similar on a brick wall in my garden – thank you! 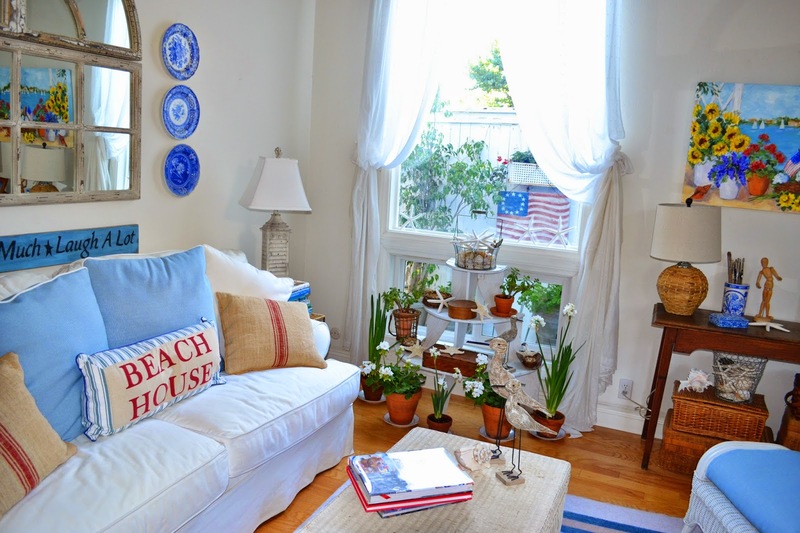 The wrought iron seat with blue canvas cushions is so attractive. You have created such a charming home and garden. 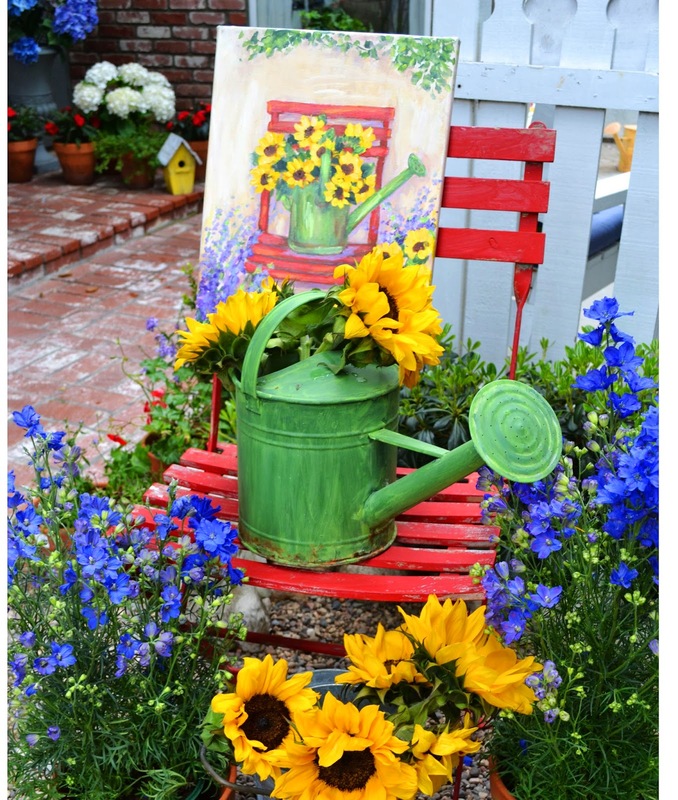 Artistic touches everywhere – I’ve decided I need more colour in my garden too! Whoever wins your giveaway will be over the moon to have an “Erin” original – please include my name! Big cuddles for Bentley and hugs for you! I have so enjoyed visiting you from GYB that I have joined your blog... your newest follower. 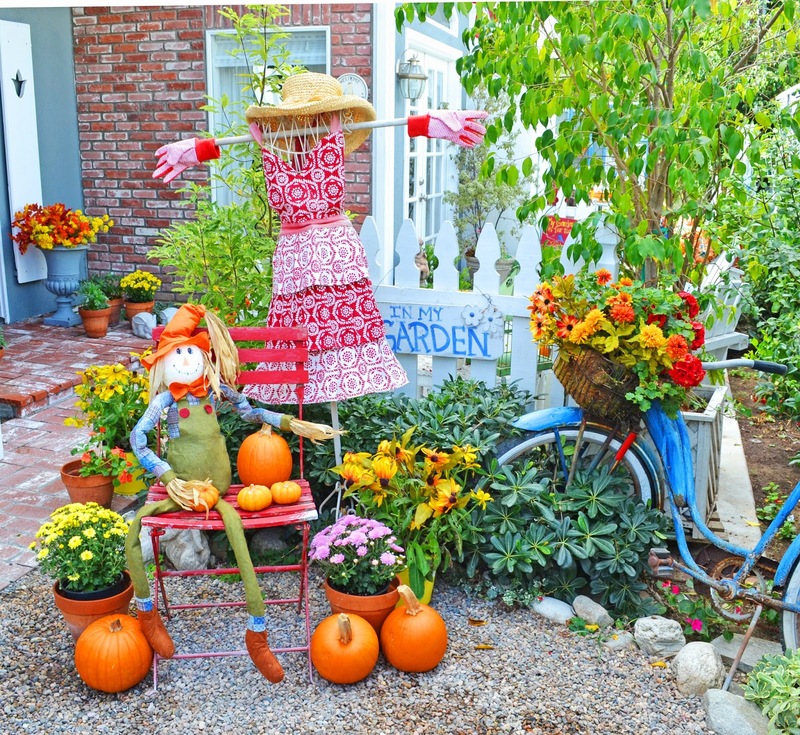 Your garden spaces are so colorful and inspiring. Will look forward to visiting you often! Congratulations on being a breast cancer survivor! and love your art to support others. Best to you from Texas and look forward to seeing you more. I found you today while sipping hot home made soup and watching the Atlantic Coast blizzard going on outside my window - what a great splash of colour- love your paintings! 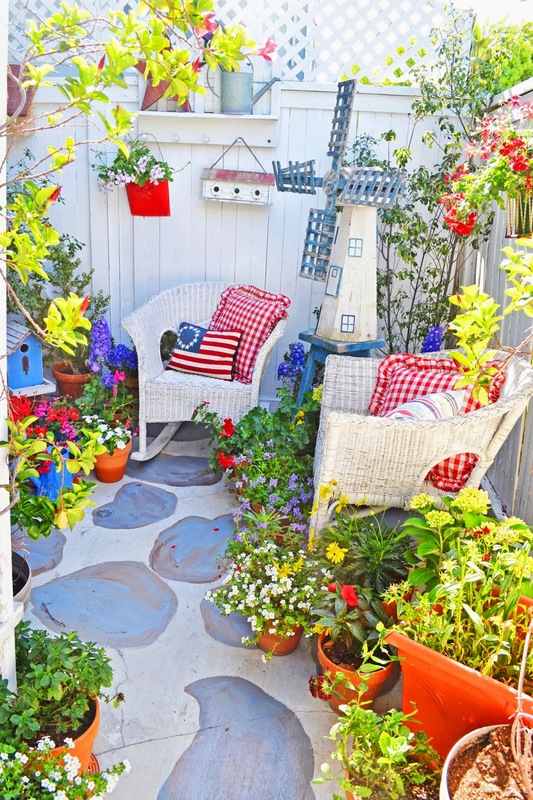 An hour in the garden is good for the soul, and from the looks of yours', you must spend many hours a day creating and planting all those lovely little rooms. 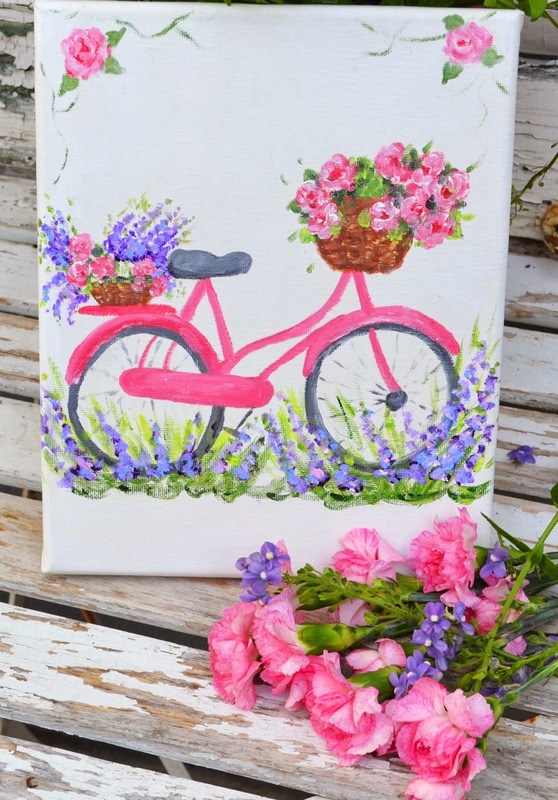 Thank you for offering your 'pink bicycle' painting as a giveaway opportunity. What a beautiful painting. Love you gardens and garden art. I've loved your blog for a long time. Your paintings are always so bright and cheery. I love the bicycle painting and what it represents. I've already been lucky enough to receive one of your paintings not long after I had tongue cancer surgery. It sits on the chest in my bedroom. Erin how lovely to meet you on the GYB party. It was a delight to see your vibrant garden, and your lovely paintings. Your interests are so similar to mine. Maybe you might like to pop over and visit me. Your give away sounds a lovely gift. Your photos are stunning! Just popping by from the GYB party and couldn't resist the lovely images! Peace back to you Erin! I love your blog, your paintings and your photos! They are joyful inspiration! Of course, I'm your follower!! hugs, Deborah http://deborahstanleyinspirations.blogspot.com/ thanks for your encouragement on my blog and via emails!! What a beautiful blog! And good for you for having a rescue. 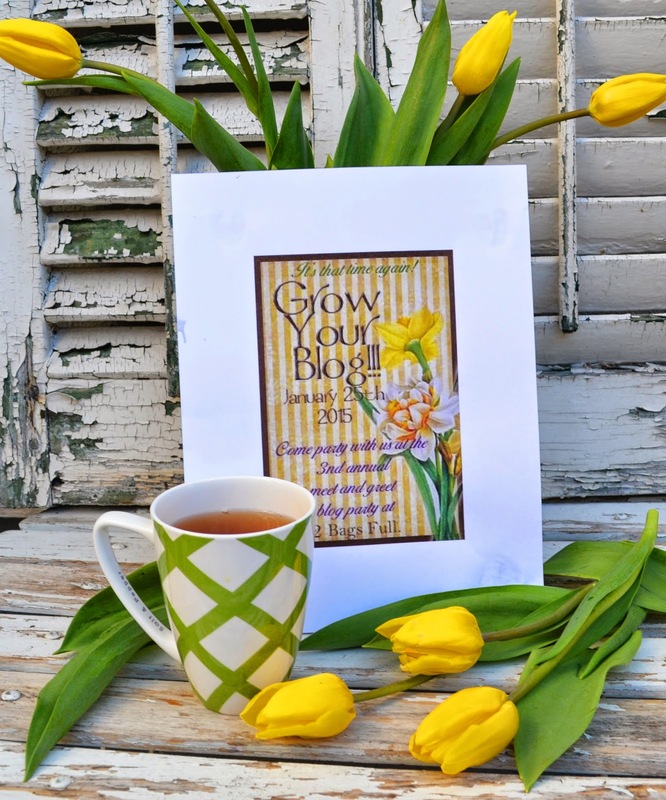 I'm still going through the huge list of participants in the Grow your Blog event. Your gardens are gorgeous. I'm a gardener and a crafter that lives in Canada. I am glad to have found your blog. I enjoyed seeing your flowers, the fresh ones and your painted ones. I will enjoy reading about them and your dog too. Hello, my dear! I am visiting from the Grow Your Blog party. Hi Erin! I'm so glad I found your blog! Love your art, gardens, decorating and of course Bentley! I'm now a follower! Hello Erin, Your garden is lovely, I particularly like blossom and love Bentley. I'd love to go in the draw for your lovely give-away. Oh my!! Everything is so beautiful on your blog!! I loved all of the primroses, Bently, and your place is just lovely!! You do beautiful, beautiful paintings! I truly enjoyed my lovely visit and my walk through your gardens!! Stunning and so bright and colorful!! Hello, I enjoyed meeting you and your blog. I enjoyed learning about you and your passions. I've became a new follower. Thanks for giving us a chance to win your giveaway. My contact info is per7867@yahoo.com. Ok, this is too funny. We are neighbors. 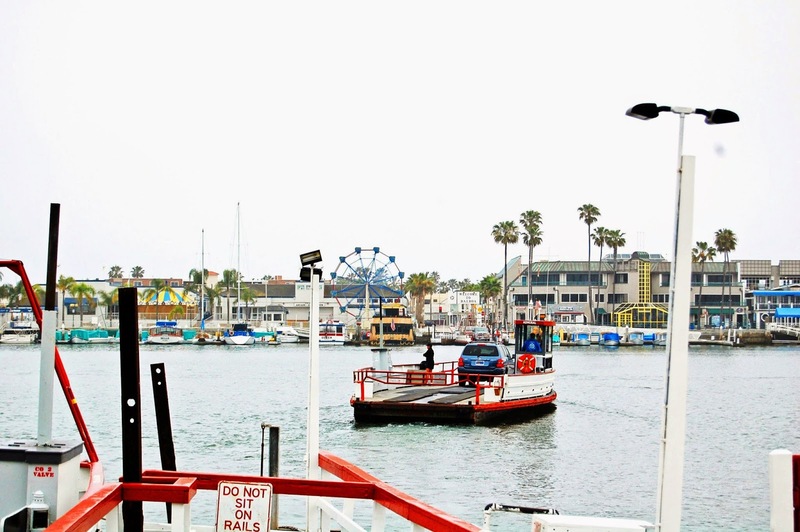 I love Balboa Island. I am due to take my dad to Rogers and I know your friends store. Of course I am also friends with Vicki-what a small world. I like your paintings-and have to laugh as I am a huge cyclist and eyeing that bike. Congrats on 13 years as a survivor. My girlfriend works at Susan Komen in OC. I love Mr. Bentley. I cannot believe I have never seen your work as I try to go to different art exhibits. 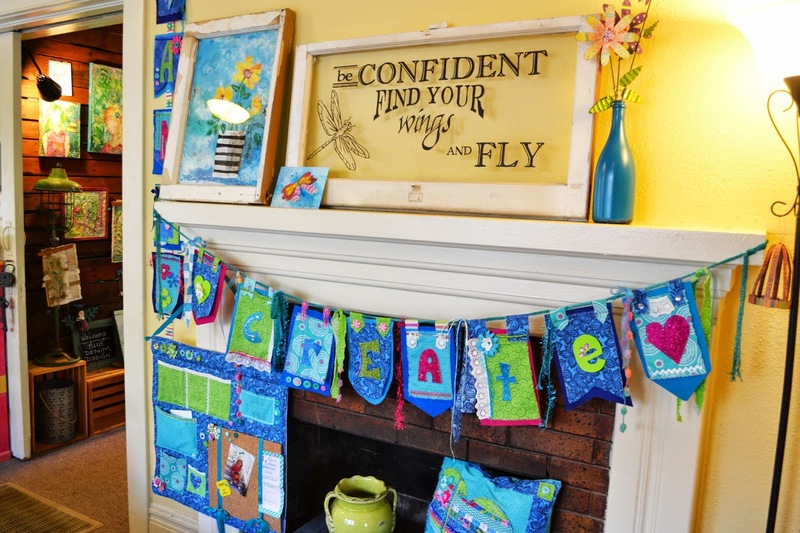 What a lovely colorful happy blog you have; so glad to visit via Vicki's GYBP! Any blogger having a dog is head's up in my book; animals make my life better and fuller. Your Blog is GORGEOUS! I'm not entering for your lovely painting, I leave that for somebody else...I just wanted to tell you how beautiful your blog is and that I am now following you on GFC. God bless you and yours! Please enter me in your drawing....I absolutely love your blog and colorful paintings and photos! I am a 12 yr survivor... and thankful for every day! You have a beautiful blog. 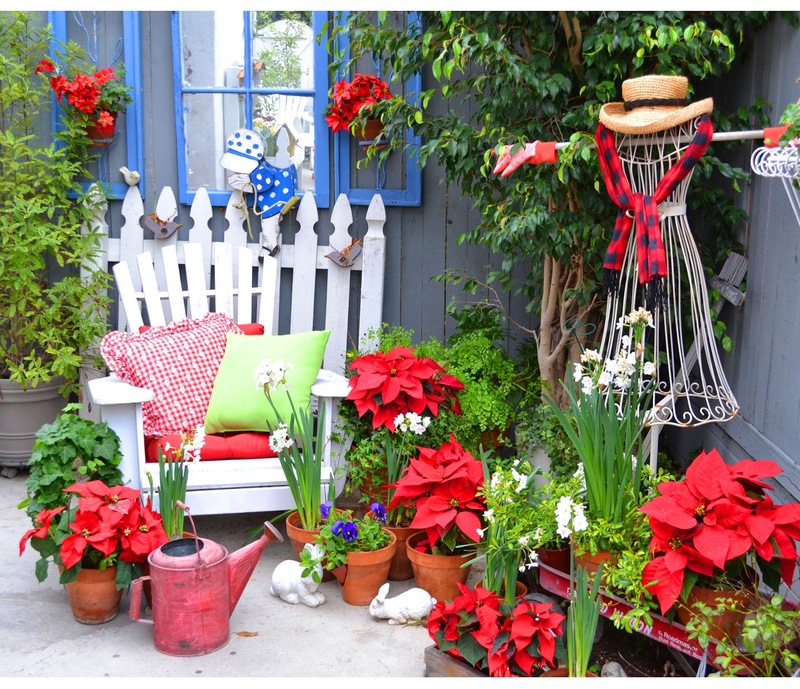 And it looks like you have so much fun going to flea markets and decorating your garden and home. Your paintings are so cute. Wish I had that talent. I know that it's too late for the giveaway (darn), but I have to tell you how enameled I am of your work. I wish we had a similar flea market in our neck of the woods. Your garden and paintings are delicious! I am now a follower of your blog.